There are 27 Assisted Living Facilities in the Middleton area, with 5 in Middleton and 22 nearby. The average cost of assisted living in Middleton is $3,715 per month. This is higher than the national median of $3,346. To help you with your search, browse the 72 reviews below for assisted living facilities in Middleton. On average, consumers rate assisted living in Middleton 4.4 out of 5 stars. Better rated regions include Waunakee with an average rating of 4.4 out of 5 stars. Caring.com has helped thousands of families find high-quality senior care. To speak with one of our Family Advisors about assisted living options and costs in Middleton, call (855) 863-8283. Middleton, WI, is a vibrant college town that’s home to the University of Wisconsin. Despite the student population, 7.8 percent of Middleton residents are between the ages of 65 and 74. Middleton has a higher average senior population than both the state and the country. There are five assisted living facilities in Middleton to accommodate this population, with 39 in nearby areas such as Madison and Fitchburg. Assisted living communities in Middleton are regulated by class and number of beds by the Wisconsin Department of Health Bureau of Assisted Living. They fall into one of three categories — adult family homes, community-based residential facilities (CBRFs) and residential care apartment complexes (RCACs). Middleton has plenty of fun activities for seniors to enjoy. The city is home to the National Mustard Museum, where admission is free. There’s also Greenway Station, which has a farmer’s market where seniors can shop for organic produce, fresh flowers and baked goods. It’s easy and affordable for seniors to get around Middleton thanks to the city’s free trolley. It has extended evening hours and stops at the city’s top stores, restaurants and attractions. Middleton has a lower crime rate than the United States on average. On a scale of 1 to 100, with 1 being the lowest crime, violent crime in Middleton is ranked at 25.5, while the U.S. ranks 31.1. There’s less property crime in Middleton, too — with a rate of 33.9 as compared to the U.S. average of 38.1. The cost of living in Middleton is 23 percent above the national average. Seniors may pay more for things like groceries and transportation. Seniors may find Middleton winters to be incredibly cold, with January lows at 10 degrees F. The city gets an average 41 inches of snow annually, while the United States only receives 26 inches per year on average. Middleton has few facilities from which to choose in the event of a medical emergency or illness, with the nearest major hospital located in Madison. Assisted Living costs in Middleton start around $3,715 per month on average, while the nationwide average cost of assisted living is $4,000 per month, according to the latest figures from Genworth’s Cost of Care Survey. It’s important to note that assisted living rates in Middleton and the surrounding suburbs can vary widely based on factors such as location, the level of care needed, apartment size and the types of amenities offered at each community. 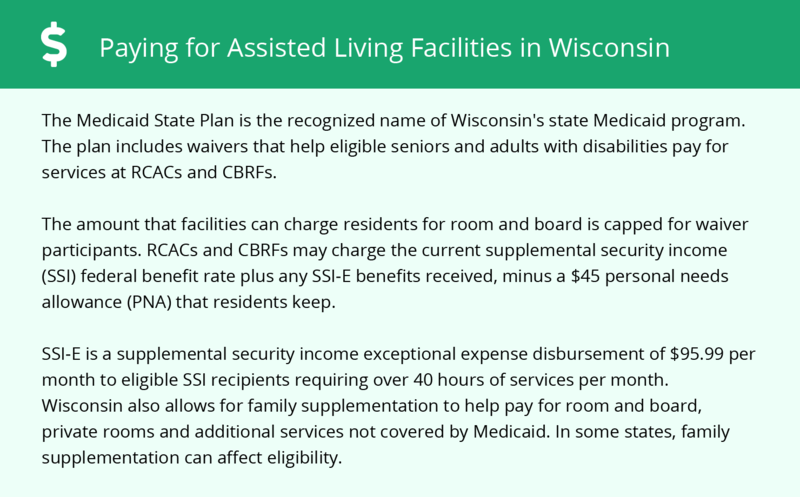 Wisconsin Medicaid may cover services from assisted living facilities with up to 20 beds. Middleton seniors who need additional help paying for assisted living may be eligible for PACE, which is also offered through Medicaid. 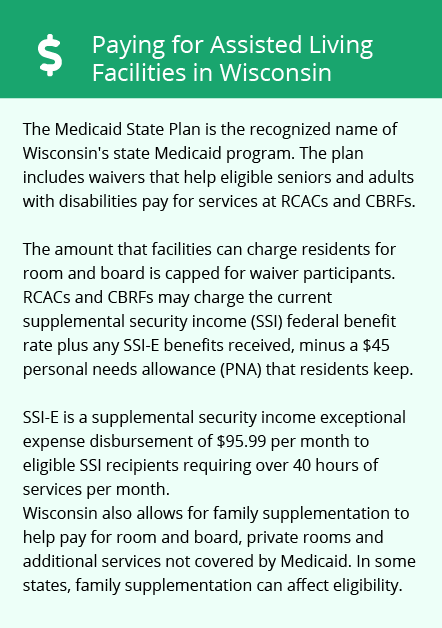 Wisconsin also has a Supplemental Security Income Exceptional Expense (SSI-E) payment for which seniors may qualify. To see a list of free assisted living resources in Middleton, please visit our Assisted Living in Wisconsin page. Middleton-area assisted living communities must adhere to the comprehensive set of state laws and regulations that all assisted living communities in Wisconsin are required to follow. Visit our Assisted Living in Wisconsin page for more information about these laws.